Amitai Etzioni argues that societies must find a way to balance individual rights and the common good. This point of balance may change as new technologies develop, the natural and international environments change, and new social forces arise. 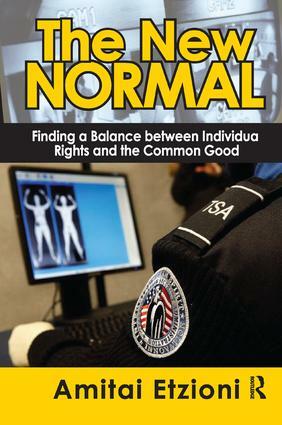 Some believe the United States may be unduly short-changing individual rights that need to be better protected. Specifically, should the press be granted more protection? Or should its ability to publish state secrets be limited? Should surveillance of Americans and others be curtailed? Should American terrorists be treated differently from others? How one answers these questions, Etzioni shows, invites a larger fundamental question: Where is the proper point of balance between rights and security? Etzioni implements the social philosophy, "liberal communitarianism." Its key assumptions are that neither individual rights nor the common good should be privileged, that both are core values, and that a balance is necessary between them. Etzioni argues that we need to find a new balance between our desire for more goods, services, and affluence, particularly because economic growth may continue to be slow and jobs anemic. The key question is what makes a good life, especially for those whose basic needs are sated. Limit Freedom of the Press? How Much Surveillance Is Legitimate? Should American Terrorists Be Tried Differently from Others? Who Authorized Preparations for a War with China?